Being sold with no chain, this two/three bedroom ground floor leasehold flat offers spacious accommodation rivalling that of a small bungalow. 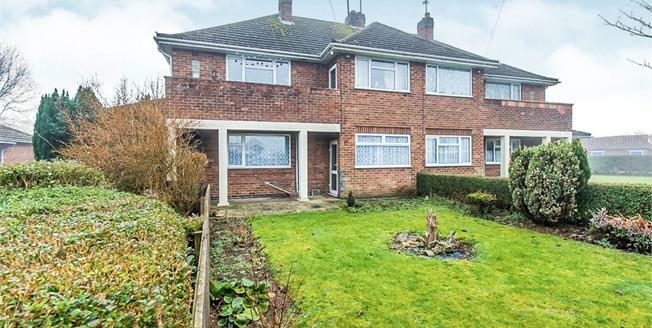 Having a good sized lounge, kitchen and refitted shower room, the property benefits from two double bedrooms and a further single bedroom that could be used as a dining room or study. Externally there are fully enclosed front and rear gardens and parking is available to the front on a first come first serve basis. Accessed via uPVC side door, having ceiling light point, power points and doors off to all main rooms. Single glazed window to front and having shelving for storage. Double glazed to front. Radiator, ceiling light point, power points and side door leading to front garden. Double glazed window to rear. Radiator, ceiling light point, power points, wall-mounted gas fired central heating boiler and door to storage cupboard. Double glazed window to rear. Radiator, ceiling light point, power points and door to cupboard housing fuse box. Double glazed window to rear. Comprising three piece suite of low level WC, double enclosure shower cubicle with wall-mounted thermostatic shower and pedestal sink. Radiator, ceiling light point and door to airing cupboard. To the front of the property there is a fully enclosed garden that is in the majority laid to lawn. A pathway leads to a door that provides access to the lounge. Another pathway leads to the side entrance door to the hall and provides access to the rear garden that is also fully enclosed by timber fencing and is low maintenance. Laid to gravel, the garden is a good size and could be adapted to a buyers needs.